Vote and you shall receive! With 20 votes sweet potato hash was the winner of our last Be Amanda’s Puppet master poll. 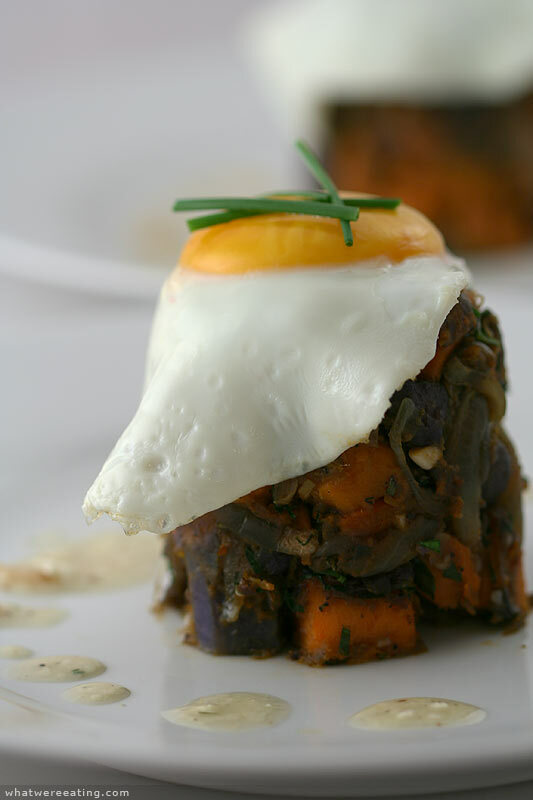 This hearty sweet and purple potato hash was made with bacon, rosemary, garlic, caramelized onions, parsley and chives then topped with an egg served sunny-side up. The plate was drizzled with a warm rosemary, feta, and lemon vinaigrette to balance out the flavors. A: So hear it is! You asked for it, you got it…Toyota!…. er… sweet potato hash! T: I just want to say that was some tasty sweet potato hash. Not only was it tasty, but it had purple potatoes in it… AND a hat of egg. A: hat’s of egg are all the rage this year, i hear. I got myself a hat of egg for easter sunday. T: Has Easter already happened? I’m confused. A: I’m about 99% certain it hasn’t. the grocery stores haven’t had any specials on lamb lately, which they normally do around easter…. mmmm lamb would have been good with this hash. T: I was thinking some sausage would be really good. How bout lamb sausage? A: hells yeah! now we’re talking. regular breakfast sausage would be good too. T: Yeah. It was great as it was, but a salty delicious meat product would have really kicked it up a notch. Although it would have been much heavier. A: true, and it was already quite heavy. maybe it could have had some sausage crumbled up into the hash. that way there wouldn’t be a big old hunk of meat to deal with…. just slightly smaller hunks of meat interspersed. T: Yeah. That would have been good to balance out the sweetness a little bit. It was quite sweet. A: no sweeteners added… just some super sweet sweet potatoes. This type of diner-ish food is stuff that really gets me going. I love things like hash browns and eggs and breakfast meats… mmmmm. Louie’s hashbrowns…. T: These were way better than Louie’s hashbrowns IMHO. Although I was a dishwasher there for a while and got really tired of eating there everyday. So my opinion is skewed. What’d you rate these hashbrowns? A: I think you’re opinion is understandably skewed. diner food definitely isn’t meant for daily consumption. As far as this diner food goes…. i give it a 4.489/5. it was wonderfully savory-y and rosemary-y. there was the distinct essence of bacon with very little bacon to be found in the actual dish. I also thought that the lemon-feta vinaigrette really helped mellow out some of the super rich flavors and give it a nice bright touch… oh yeah, and who doesn’t love a good runny yolk! T: only the crazies. I give the meal a 4.57/5. I also enjoyed the vinaigrette… I especially enjoyed dipping the potatoes in the little vinaigrette puddles on the plate. Overall this was extremely tasty. I’m not used to the purple potatoes, so that added a fun newness to the whole thing. A: i know, i’ve only cooked them a handful of times. mainly because we don’t really eat too many potatoes. this meal was fun for me because I got to run with the “sweet potato hash” theme, since that was the winner of our recent side bar Puppet master poll. T: I’m still hoping you’ll make the little Mermaid pulled sugar sculpture that somebody suggested from the first Amanda-plays-puppet poll. A: yeeeeaaah…. because i could totally make a realistic little mermaid pulled sugar sculpture… Thanks bobby! 😛 you’re always full of great suggestions…. seriously though, i really do always get a kick out of your suggestions. I just pray nobody votes for them so I don’t have to actually attempt them! T: note to self, cheat on the poll to get what I want. Place a large skillet over medium heat. Once the skillet has heated, add the bacon. Fry the bacon until all the fat has been rendered and the bacon is fully cooked. While the bacon is cooking, add the cubed potatoes to a large pot with enough water to cover the potatoes. Add a liberal amount of salt to the water. Place the pot with the potatoes onto the stove over high heat. Bring the pot to a boil. Once the pot has reached a boil, test the doneness of the potatoes: using a fork, stab a couple of different cubes. If the cubes are tender when pierced and easily come off of the fork, the potatoes are done. Strain the parboiled potatoes. Once the bacon is done, remove it from the pan and drain it on paper towels. Crumble the bacon once it has cooled and set aside. In the same skillet over medium heat, using the rendered fat, saute the sliced onion until soft, about 10 minutes. Add the parboiled potatoes, rosemary, and garlic to the pan. Raise the heat to medium high and fry the potatoes for 10-15 minutes. Allow the hash to cook, untouched, for several minutes before stirring or flipping. This will allow proper caramelization. Stir or flip the hash a few times while sauteing. Once the potatoes are browned and crispy on all sides, add the parsley, green onions, and crumbled bacon to the skillet. Toss to combine thoroughly. Taste a bite of the hash then season as necessary with kosher salt and fresh cracked black pepper. Serve hot. Goes great with a tangy lemon vinaigrette. Enjoy! In a mixing bowl, combine the first 5 ingredients. Whisk until thoroughly mixed. While continuously whisking, slowly drizzle in the canola oil to form an emulsified vinaigrette. Taste the vinaigrette and season with salt and pepper as necessary. Great on salads, as a sauce for grilled meats, or even sweet potato hash. Enjoy! look at that egg balanced atop the potato tower! YUM, theres no two ways about it. i d’amanda you make this for me! harhar, i think the egg hat is going to my head. its just so pretty….. i want to break the yolk so bad, major drooool. One might say it is Amandatory that she make it for you. Amanda wants to be a puppet, she likes having someone else’s hand up her……. Nothing’s better than a fried egg on top of anything. That really sounds tasty. I like the sound of the tangy vinaigrette with the sweet potatoes. I have some kind of black/purple potatoes that I found at a farmers market. I don’t think they’re like your purple potatoes but I’m really not sure if they’re waxy, or floury or what. It’s going to be interesting finding out. wow1 it really looks delicious. Amanda, this sounds so yummy! Happy Easter guys! Very nice and I really like the look of the egg on top. Anyway Happy Easter to both of you! This would have been super if I had gone thru with the lemon vinagrette. I just squeezed a lemon on it, but very, very good anyway. !